Although it is always a great day for hockey, as Badger Bob Johnson would cheerfully say, it is certainly not for every game on the NCAA schedule that the most exciting player in the entire country comes to skate in town. With that thought front and center, it is hard to imagine that those in State College who can appreciate exceptional talent really went home Saturday night even the slightest bit disappointed. For there is never any real shame in losing to the best and that is a description which is truly befitting of Boston College superstar left wing JOHNNY GAUDREAU. The fourth round choice (# 104 overall) of the Calgary Flames at the 2011 National Hockey League Draft stretched his point-scoring streak against collegiate competion this season to an even 20 games by notching a goal and an assist in the Eagles’ 3-2 triumph over host Penn State. Indeed, the prolific Gaudreau, who was honored as an NCAA (East) First Team All-America after a tremendous sophomore campaign (35 ga, 21 go, 51 pts) a year ago, has registered at least one point in all but one of Boston College’s 25 contests so far this term and is clearly on pace to far exceed last season’s impressive totals. As a matter of fact, only the # 1 ranked University of Minnesota Golden Gophers have been able to keep the 20-year-old junior from Carney’s Point, New Jersey, off the scoresheet. Gaudreau’s strike against the Nittany Lions late in the second period at the lovely Pegula Ice Arena not only gave the Eagles a lead it would never reliquish, but a 22nd goal of this season also established a new career high for the little winger who, without question, has to be considered the overwhelming favorite to win the coveted Hobey Baker Memorial Award this term. A hat trick’s worth of goals from a pair of top shelf Hobey Baker Memorial Award candidates and standout netminding from the freshman who is widely considered to be the very best goaltending prospect in all of North America eligible to be selected at the annual National Hockey League Draft coming up this summer enabled # 2 ranked BOSTON COLLEGE to outlast late charging PENN STATE 3-2 in an NCAA non-conference clash at the lovely Pegula Ice Arena in State College. Rough wintery conditions in central Pennsylvania prevented one of the two assigned referees from ever making it to the match but the official attendance total of 6,214 spectators at The Peg, itself, represented Penn State’s second largest crowd of this 2013/14 season to the new $ 88.0 million dollar hockey rink on campus that was generously financed by the current owner of the NHL’s Buffalo Sabres, TERRY PEGULA. The Nittany Lions came out with a lot of energy and sought to pressure the more patient Eagles whenever possible all over the ice. This aggressive policy paid immediate dividends, as did head coach GUY GADOWSKY’s season-long strategy of not trying to be too fancy with possession but rather simply trying to focus on getting a good number of pucks to the front of the net. And so Penn State were able to generate four shots on target in the first five minutes with nary a single reply from their more skillful guests. Boston College, however, were able to show why it was the Eagles who entered the contest as THE highest scoring team in all of Division I college hockey and soon found the back of the net with what was their very first official shot on goal of the game a little more than seven and a half minutes in. It was a rather flukey goal, to be fair, that was credited to right wing KEVIN HAYES, the 21-year-old senior from Dorchester, Massachusetts, who was the first round choice (# 24 overall) of the Chicago Black Hawks at the 2010 NHL Draft and is currently enjoying what is, by far, his best season ever (25 ga, 19 go, 45 pts) at the NCAA collegiate level. The odd-looking goal was, however, clearly the direct by-product of a noteworthy individual effort from Eagles senior center BILL ARNOLD, who turned Penn State sophomore defenseman CONNOR VARLEY (13 ga, 0 go, 0 pts, – 11 def rat) inside out with his stickhandling into the slot area after a threatening rush down the right wing side. (Penn State, for the historical record, has also recently conceded goals on their opponent’s first official shot of the game against Big Ten foes Wisconsin and Minnesota earlier this season, as well). Penn State rearguard CONNOR VARLEY (2), the homegrown sophomore from Lansdale who led all Nittany Lions defensemen in scoring with a dozen points (four goals) last season, skates the puck up ice against the powerful Boston College Eagles during the NCAA non-conference meeting in front of an overflow crowd at the Pegula Ice Arena in State College. The hosts had a great opportunity to pull level near the ten-minute mark with what was only one of what would be ten odd-man rushes on this night for the Nittany Lions. But Boston College freshman goaltender THATCHER DEMKO snuffed out that chance by displaying form that would allow the 18-year-old from San Diego, California, to make 33 saves on this particular night in snowy State College, Pennsylvania. At the other end of the rink, Penn State’s homegrown rookie shot-stopper EAMON MCADAM was busy showing off some of the potential that convinced the New York Islanders to select the 19-year-old from Perkasie in the third round (# 70 overall) of the 2013 NHL Draft. Penn State continued to have more of the play at the start of the second period and tricked the goal judge into thinking they had tied the game when an unlucky shot from Nittany Lions center MAX GARDINER struck the iron and rolled across the face of goal before the puck could be cleared about four minutes in. But the red light had been inaccurately lit and so the third round pick (# 74 overall) of the St. Louis Blues at the 2010 NHL Draft who was the third-leading scorer with 22 points Penn State last term continued with his quest for a first goal of this 2013/14 NCAA season. It was certainly not the first time this season that the snake-bit Gardiner (14 ga, 0 go, 1 as) has been denied by the goal cage, truth be told. The Nittany Lions were able to equalize, though, almost three minutes later after the lone referee might have been a bit slow to blow the whistle and opportunistic Penn State center ERIC SCHEID (20 ga, 10 go, 15 pts) was able to push the puck over the goal line. The Eagles netminder Demko did well to make a point blank save off of Nittany Lions Canadian legionnaire MIKE WILLIAMSON (12 ga, 1 go, 4 pts, – 2 def rat), the freshman defenseman from Leduc, Alberta, who was chosen by the Vancouver Canucks in the sixth round (# 175 overall) of the 2013 NHL Draft, and thought he had done enough to freeze the puck under his outstretched left pad. But the officials begged to differ with the teenage Eagles custodian and so the 21-year-old sophomore from Blaine, Minnesota, was able to celebrate his team-leading tenth goal of this season. Boston College, who are in the midst of what is now an eleven-game unbeaten streak with ten wins recorded during this successful run, almost regained the advantage halfway through the second period when Arnold, the 21-year-old from Needham, Massachusetts, who was the fourth round selection (# 108 overall) of the Calgary Flames at the 2010 NHL Draft, smacked his shorthanded shot from prime real estate in between the hashmarks off the Penn State crossbar. The surging Eagles (18-4-3) would take the lead once and for all after superstar left wing JOHNNY GAUDREAU (25 ga, 22 go, 50 pts) took possession of a loose puck in his own defensive zone with a little over four minutes remaining until the second intermission. The exciting 20-year-old junior from Carney’s Point, New Jersey, quickly sent a picturesque, tape-to-tape pass across the width of the rink to his center Arnold up near the Nittany Lions’ blue line on the right wing and then raced down the ice to get in position for a return feed. The crafty Arnold then wisely held the puck until Penn State’s standout defenseman, LUKE JUHA (20 ga, 4 go, 13 pts, -2 def rat), was forced to commit before distributing to the wide-open Gaudreau in the slot … and a deadly deke to the backhand illustrated beautifully why Boston College’s returning NCAA (East) First Team All-America is the very best player in all of college hockey. The home team had a couple of good chances on the power play at the start of the third period but were, once again, foiled by a combination of quality goaltending from the Eagles freshman Demko as well as a bit of bad luck. Penn State left wing CASEY BAILEY (16 ga, 2 go, 4 pts), the 22-year-old sophomore from Anchorage, Alaska, who led the Nittany Lions with 27 points (14 goals) in 27 NCAA games last season, had a wide open goal to shoot at with Demko down and out after yet another save. But the puck was unsettled and up on edge so Bailey could do little more than hurriedly golf the little black disc high over the net. Not so long afterwards, Penn State (4-15-1), as it has done seemingly time and time again this term, effectively shot itself in the foot by taking another critical penalty. On this occasion, the culprit was Canadian legionnaire JONATHAN MILLEY (12 ga, 0 go, 2 pts), the monster 22-year-old sophomore (6’4″ 245 lbs) right wing from Gatineau, Quebec, and his boarding offense was subsequently punished by five minutes in the penalty box. Boston College, whose 4.48 goals per game average is essentially two-thirds of a goal per game higher than the nearest rival in all of Division I college hockey, needed exactly 22 seconds to cash in on the power play. The influential Arnold (25 ga, 8 go, 36 pts), who is now the fifth-highest scorer in all of Division I college hockey, and Eagles second line center PATRICK BROWN (25 ga, 6 go 14 pts), the 21-year-old senior from Bloomfield Hills, Michigan, whose father was a long-time National Hockey League performer once upon a time, double-teamed Bailey in a battle for the puck along the boards behind the Nittany Lions net before Boston College’s first line pivot gained control. An inviting pass out into the slot for the lurking Hayes and a quick, first-time blast from the NCAA’s second leading scorer this season rang off the iron and in, again, to put the heavily-favored visitors ahead 3-1. With well more than four minutes remaining on Milley’s boarding major, some might have thought the floodgates were ready to be opened. But Penn State captain TOMMY OLCZYK, the 23-year-old junior left wing from Long Grove, Illinois, who specializes in penalty-killing, soon got behind the Eagles defense on a shorthanded breakaway and Boston College defenseman TEDDY DOHERTY (13 ga, 2 go, 9 pts, + 7 def rat) had no other choice but to haul down the Nittany Lions skipper. A penalty shot was correctly awarded but Olczyk (20 ga, 4 go, 7 pts), who is among a host of Penn State players tied for second on the team in goal-scoring this term, was agonizingly unsuccessful with his bid to beat the Eagles netminder Demko (10 ga, 2.17 avg, .919 svpct) to the stick side. However, the Nittany Lions’ penalty killers were not to be denied the opportunity to register their fourth goal already this season. And so center TAYLOR HOLSTROM, the 23-year-old redshirt junior from Yorba Linda, California, led a two-on-one shorthanded rush in the Boston College zone before carefully weighing his options. 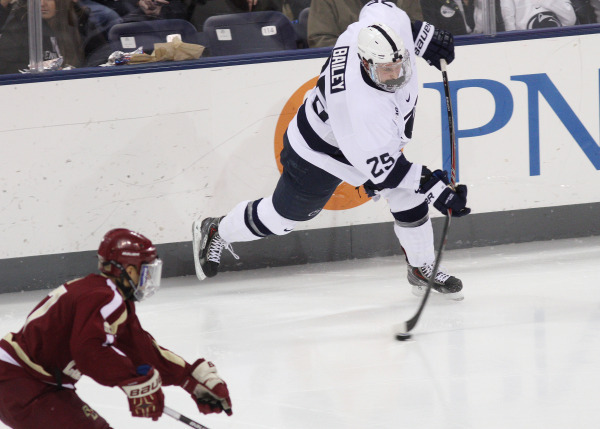 Using Penn State freshman winger DAVID GOODWIN as a decoy perfectly, Holstrom was able to lift an accurate wrist shot from the right circle over the shoulder of Demko to cut the Nittany Lions’ deficit in half as well as pump new life into the faithful at the Pegula Ice Arena. It was a third goal in as many weeks for Holstrom (20 ga, 4 go, 9 pts), who was, along with Olczyk and redshirt junior defenseman NATE JENSEN, one of only three players in the line-up against the # 2 ranked Eagles who are leftovers from Penn State’s “club hockey” days. The inexperienced Nittany Lions would get a little overly exciting on yet another shorthanded rush into the Boston College zone at the tail end of Milley’s major for boarding and were assessed a too many men on the ice penalty for a second time in the contest. The marvelously gifted Gaudreau had a golden opportunity to put the game out of reach for the Eagles after taking a great pass from Hayes but failed to beat the improving McAdam (8 ga, 3.94 avg, .889 svpct) in a one-on-one situation in front with about three and a half minutes to play. 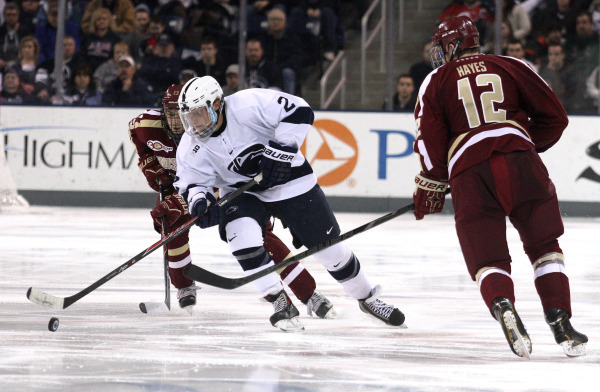 Penn State were, ultimately, able to pull its goaltender in exchange for a sixth attacker and give Boston College a tense moment or two at the end. But Demko and the rest of the Eagles defensive corps held firm and were able to bring their trip down from New England to a satisfactory conclusion. Penn State goaltender EAMON MCADAM (34) stretches out to save the puck at the skates of Boston College right wing AUSTIN CANGELOSI (26) during the NCAA non-conference clash that was watched by the second largest crowd of this 2013/14 season at the Pegula Ice Arena in State College, Pennsylvania. Boston College Canadian legionnaire MIKE MATHESON (5), the 19-year-old sophomore defenseman from Pointe-Claire, Quebec, who was the first round pick (# 23 overall) of the Florida Panthers at the 2012 NHL Draft and a unanimous Hockey East All-Rookie Team selection last season, shields the puck from Penn State right wing RICKY DEROSA (21), the homegrown freshman from Ashton who has done alright for himself (18 ga, 3 go, 8 pts) at both ends of the rink during his first season of collegiate hockey, during the tightly-contested NCAA non-conference match-up at the jam-packed Pegula Ice Arena in State College, Pennsylvania. Between The Pipes At Penn State? A pair of freshman meet in a less than friendly atmosphere as Boston University right wing KEVIN DUANE, the 20-year-old undrafted rookie from New Canaan, Connecticut, confronts Boston College goaltender THATCHER DEMKO (30), the 18-year-old from San Diego, California, who is currently rated the number one North American goaltending prospect eligible for this summer’s 2014 National Hockey League Draft by the NHL’s own Central Scouting Services department, in a one-on-one situation during the 263th installment of the famed BATTLE OF COMMONWEALTH AVENUE that was contested at the Jack Parker Rink of the Agganis Arena in Beantown early last November. When surging BOSTON COLLEGE EAGLES (17-4-3) and slumping PENN STATE NITTANY LIONS (4-14-1) meet for the second time this season on Saturday night, it will be interesting to see which goaltender the well stocked visitors decide to start between the pipes against the brave but outmanned hosts at the lovely Pegula Ice Arena on campus in University Park. Junior BRIAN BILLETT (15 ga, 2.40 avg, .920 svpct) has appeared in a majority of Boston College’s games thus far this season but was beaten four times on only twenty-seven shots by fierce intra-city arch-rival Boston University his last time out. On the other hand, highly touted freshman THATCHER DEMKO (9 ga, 2.18 avg, .915 svpct) has been solid while starting the Eagles’ last two games in Hockey East against the University of Maine and Merrimack College. Demko has also been tapped to be the first choice by Boston College head coach JERRY YORK in three of the Eagles last four games. Demko, of course, was the third string goaltender for the United States’ entry at the 2014 IIHF World Junior Championships in Sweden and, thus, was not available to Boston College at the 2nd Annual Three Rivers Classic holiday tournament in Pittsburgh. The streaking BOSTON COLLEGE EAGLES will invade the brand new Pegula Ice Arena on the campus of the Pennsylvania State University sporting the impressive record of seventeen wins against four losses with three ties and ranked # 2 in all of college hockey by both major polls (USCHO.com and USA Today / USA Hockey Magazine). The explosive Eagles are, in fact, THE highest scoring team of all 59 schools that skate at the NCAA Division I level having netted an average of 4.54 goals per game this season and are powered by a pack of well regarded National Hockey League prospects led by not one but two legitimate Hobey Baker Memorial Award candidates. Boston College, who are now unbeaten in their last ten games (nine wins and one tie), have established a massive eight-point lead in Hockey East after going 10-1-1 in their first dozen conference matches. Eagles head coach JERRY YORK had to make due without three talented underclassmen who were with the United States squad at the 2014 IIHF World Junior Championships in Sweden when Boston College met Penn State in the final of the 2nd Annual Three Rivers Classic holiday tournament in Pittsburgh. But this particular trio has long since returned from Scandinavia to strengthen a BC defensive corps which is ranked 14th in the nation at present having conceded an average of 2.33 goals per game. Indeed, the highly experienced York has also re-shuffled his line-up somewhat since the Eagles lit up the Nittany Lions 8-2 at the Consol Energy Center four weeks ago. The prolific first line which has accounted for 46 goals in Boston College’s first twenty-four games this term remains unchanged. Superstar left wing JOHNNY GAUDREAU (24 ga, 21 go, 48 pts), the 20-year-old junior from Carney’s Point, New Jersey, who was chosen in the fourth round (# 104 overall) of the 2011 NHL Draft by the Calgary Flames will set a new personal season-best with his next goal for the Eagles and is joined on this year’s official Hobey Baker Memorial Award ballot by right wing KEVIN HAYES (24 ga, 17 go, 43 pts), the 21-year-old senior from Dorchester, Massachusetts, who was the first round pick (# 24 overall) of the Chicago Black Hawks at the 2010 NHL Draft. Providing plenty of quality service at center is BILL ARNOLD (24 ga, 8 go, 33 pts), the 21-year-old senior from Needham, Massachusetts, who was the fourth round selection of the Calgary Flames at the 2010 NHL Draft. Two standout freshmen, RYAN FITZGERALD (24 ga, 8 go, 21 pts) and AUSTIN CANGELOSI (24 ga, 8 go, 18 pts), have been shifted onto a line centered by PATRICK BROWN (24 ga, 6 go, 13 pts), the 21-year-old senior from Bloomfield Hills, Michigan, whose father, Doug Brown, played for Boston College in the mid-1980s before going on to skate in 854 NHL games for the New Jersey Devils, Pittsburgh Penguins and Detroit Red Wings. Fitzgerald, the 19-year-old from North Reading, Massachusetts, was tabbed by the Boston Bruins in the fourth round (# 120 overall) of the 2013 NHL Draft and is the son of Tom Fitzgerald, the one-time Providence College winger who was the first round pick of the New York Islanders that went on to appear in 1,054 NHL contests for a variety of different clubs. Cangelosi, the 18-year-old who originally hails from Estero, Florida, is eligible for the annual National Hockey League Draft but could be completely passed over because of his diminutive size (5’6″ 170 lbs). DANNY LINELL (24 ga, 1 go, 12 pts), the 21-year-old junior from Great Neck, New York, who had been spending a filling in on the blue line for Boston College for a considerable length of time this season, has returned to his more normal right wing position and has been working as of late with center MICHAEL SIT (23 ga, 5 go, 7 pts), the 21-year-old junior from Edina, Minnesota, who appeared in 39 of the team’s 44 games as a freshman when the Eagles concluded the 2011/12 NCAA campaign as national champions, and left wing QUINN SMITH (24 ga, 2 go, 11 pts), the 22-year-old junior from Fairfield, Connecticut, who skated in 32 games as a freshman for title-winning Boston College two seasons ago. The Eagles’ fourth line is also quite capable and further illustrates Boston College’s overall depth by featuring another set of NHL prospects. Center ADAM GILMOUR (24 ga, 5 go, 13 pts), is the almost 20-year-old freshman from Hanover, Massachusetts, who was gobbled up by the Minnesota Wild in the fourth round (# 98 overall) of the 2012 NHL Draft, and left wing CHRIS CALNAN (21 ga, 3 go, 9 pts), is the 19-year-old rookie from Norwell, Massachusetts, who reserved by the Chicago Black Hawks in the third round (# 79 overall) of the 2012 NHL Draft. Completing the trio is BRENDAN SILK (22 ga, 1 go, 4 pts), the recently-turned 20-year-old sophomore from Wakefield, Massachusetts, who is, indeed, a cousin of 1980 Olympic gold medalist Dave Silk. The unlucky skater left out these days has been Canadian legionnaire DESTRY STRAIGHT (18 ga, 6 go, 9 pts), the 19-year-old freshman center from West Vancouver, British Columbia, who previoulsy scored three of the rampant Eagles’ goals in runaway triumph over Penn State in Pittsburgh. Boston College defenseman SCOTT SAVAGE (28) competes for the loose puck with Penn State captain TOMMY OLCZYK (14) during the one-sided championship game of the 2nd Annual Three Rivers Classic holiday tournament that was watched by the crowd of 8,222 spectators at the Consol Energy Center in Pittsburgh, Pennsylvania. Canadian legionnaire ISSAC MACLEOD (24 ga, 0 go, 8 pts, + 12 def rat), the 21-year-old senior from Nelson, British Columbia, who was snatched by the San Jose Sharks in the fifth round (# 136 overall) of the 2010 NHL Draft, is, by far, the most experienced defenseman for Boston College and has good size (6’5″ 210 lbs). The head coach York has been matching MacLeod with promising freshman IAN MCCOSHEN (22 ga, 4 go, 11 pts, + 20 def rat), the 18-year-old from Fairbault, Minnesota, who was the second round choice (# 31 overall) of the Florida Panthers at the 2013 NHL Draft and one of the three Eagles who appeared with the United States at the recent IIHF World Junior Championships in Sweden, lately. McCoshen also brings a decent amount of size (6’3″ 205 lbs) to the table and leads all Boston College blueliners with four goals scored a very encouraging + 20 defensive rating. The most well regarded Boston College skater, at least as far as the professionals who make a living in the National Hockey League are concerned, is Canadian legionnaire MIKE MATHESON (23 ga, 3 go, 13 pts, + 17 def rat), the 19-year-old sophomore from Pointe-Claire, Quebec who was the first round pick (# 23 overall) of the Florida Panthers at the 2012 NHL Draft. Named by Hockey East as to the conference’s All-Rookie Team last season, the offensive-minded Matheson leads all Eagles defensemen with both ten assists and thirteen points this term. Matheson’s partner in recent games has been STEVEN SANTINI (19 ga, 2 go, 7 pts, + 17 def rat), the 18-year-old freshman from Mahopac, New York, who was the second round selection (# 42 overall) of the New Jersey Devils at the 2013 NHL Draft last summer and also represented the United States at the annual IIHF World Junior Championships this winter. The third defensive unit for Boston College at the moment is comprised of a pair of underclassmen who have both already shown the ability to get involved in the attack for the Eagles. TEDDY DOHERTY (12 ga, 2 go, 9 pts, + 8 def rat), the 19-year-old sophomore from Hopkinton, Massachusetts, totaled a goal and 17 assists while skating in 38 games as a freshman last term but was a often a healthy scratch at the beginning of this season before regaining his place in the line-up. Rookie SCOTT SAVAGE (20 ga, 3 go, 11 pts, + 9 def rat), the 18-year-old from San Clemente, California, who was turning out for the so-called United States National Team Developmental Program entry in the United States Hockey League twelve months ago, has already demonstrated the ability to find the back of the net at the collegiate level. The real question with respect to Boston College appears to be who will start between the pipes at the Pegula Ice Arena in State College — the more experienced junior BRIAN BILLETT (15 ga, 2.40 avg, .920 svpct) or the highly rated freshman THATCHER DEMKO (9 ga, 2.19 avg, .915 svpct)? Boston College goaltender BRIAN BILLETT (1), the 21-year-old junior from Brunswick, Maine, had a career high 40 saves against intra-city arch-rival Boston University in only his second collegiate start as a freshman for the the 2012 NCAA nationl champions but then made a total of just two appearances (3.96 avg, .853 svpct) while only playing a little less than a combined 76 minutes throughout his entire sophomore campaign for the Eagles last season; Billett has rebounded well, however, from that disappointing experience and has now appeared in 25 career NCAA games (2.57 avg, .913 svpct) while improving his career record for Boston College to fourteen wins against seven losses with two ties. The BOSTON COLLEGE EAGLES’ contemporary equivalent of the famed “Production Line” — left wing JOHNNY GAUDREAU (12), center BILL ARNOLD (24) and right wing KEVIN HAYES (12) — gather to celebrate after scoring a late first period goal against Big Ten Conference opponent Penn State during the one-sided championship game of the 2nd Annual Three Rivers Classic holiday tournament that was watched by the crowd of 8,222 spectators at the Consol Energy Center in Pittsburgh, Pennsylvania. Canadian legionnaire ISSAC MACLEOD, the 21-year-old senior from Nelson, British Columbia, who was the fifth round choice (# 136 overall) of the San Jose Sharks at the 2010 National Hockey League Draft, is the only defenseman for the Boston College Eagles who has yet to score a goal this season … MacLeod has netted exactly twice in 125 career NCAA games. Boston College reserve defenseman TRAVIS JEKE, the 20-year-old native of Pittsburgh, Pennsylvania, had made 22 appearances and registered five points (two goals) as a freshman for the Eagles last season but has played sparingly for head coach JERRY YORK thus far this term. However, the opportunistic Jeke did skate in both of Boston College’s games at the 2013 Three Rivers Classic in Pittsburgh and enjoyed a very productive tournament highlighted by a goal and two points against Bowling Green in the semifinal contest at the Consol Energy Center. It will be interesting to see whether or not York gives Jeke another game when the Eagles meet the Nittany Lions at the Pegula Ice Arena in State College. Boston College BRIAN BILLETT (1), the 21-year-old junior from Brunswick, Maine, who made only two appearances (3.96 avg, .853 svpct) as a sophomore last term after starting eight games (2.66 avg, .907 svpct) for the Eagles as freshman two seasons ago, allowed just one goal while stopping 58 of 59 shots faced in two games against Bowling Green and Penn State at the 2nd Annual Three Rivers Classic in Pittsburgh this past December. 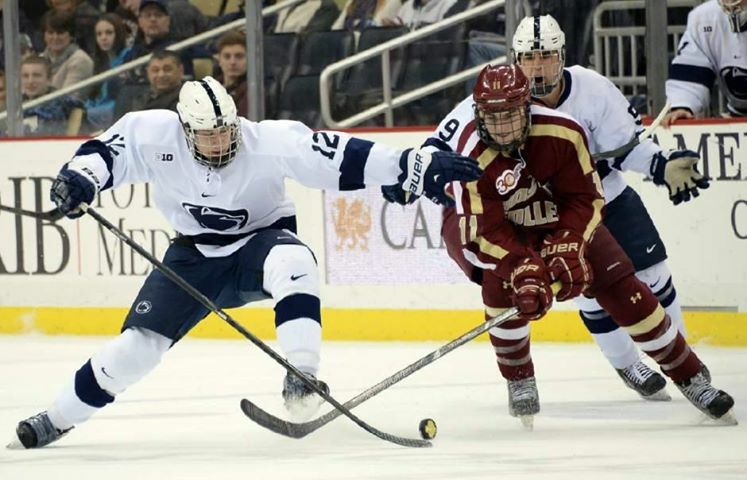 The PENN STATE NITTANY LIONS are all but guaranteed to finish on the short side of the scoreboard when the powerful and currently # 2 ranked BOSTON COLLEGE EAGLES invade the lovely Pegula Ice Arena in State College this Saturday night. However, no matter how low temperatures might plummet in the heartland of Pennsylvania this weekend, any and all Nittany Lions supporters who can legitimately identify themselves as connoisseurs of veritable ice hockey excellence still have every reason to show up at the new rink on campus in University Park. Because, while it is true that brave Penn State have been playing host at The Peg to a bona fide parade of top shelf Division I programs virtually all season long, it is certainly NOT every game that one has the unique opportunity to witness THE very best player in all of college ice hockey up close, live and in person. As luck would have it, Boston College star left wing JOHNNY GAUDREAU just so happens to be a native to the neighboring state of New Jersey and will likely have at least a few family members and friends in the audience on Saturday night. Thus, it stands to reason that the prolific 20-year-old from Carney’s Point has every incentive to be at the very peak of form and production when the explosive Eagles take the ice against the struggling Penn State pucksters. With the voting for the annual HOBEY BAKER MEMORIAL AWARD still well underway, whether or not the gifted Gaudreau will deliver the kind of virtuoso performance that can mesmerize an entire crowd remains to be seen. Gaudreau came very close to snatching the prize that is college hockey’s equivalent of the famed Heisman Trophy last year as a sophomore after racking up 21 goals and 51 points in 35 games for a Boston College squad (22-12-4) that started the 2012/13 NCAA campaign as the reigning national champions but was ultimately knocked out of the annual NCAA men’s ice hockey tournament by Union College in the very first round. Despite this setback, the Eagles’ leading scorer was still singled out by the 23-person selection committee as one of the three finalists for the prestigious title of Hobey Baker winner. 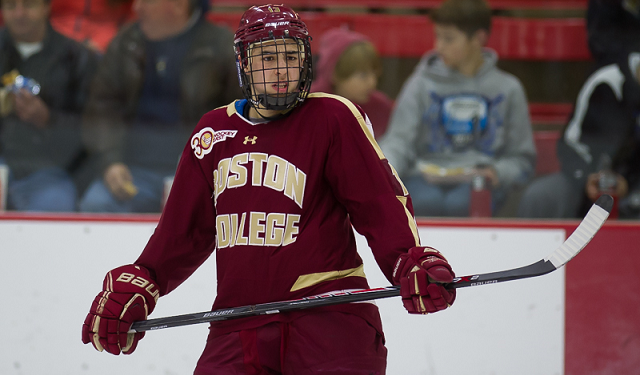 Additionally, Gaudreau was chosen as an NCAA (East) First Team All-America and, in doing so, became the 33rd player in Boston College school history to achieve such lofty distinction. All of these post-season accolades, of course, came just a few months after Johnny Hockey had greatly helped the United States win the gold medal at the 2013 IIHF World Junior Championships by scoring seven goals in seven games at the tournament held in the Russian city of Ufa. 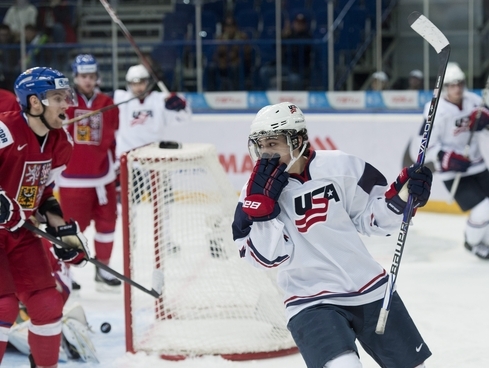 Boston College left wing JOHNNY GAUDREAU averaged a goal per game while totaling nine points in seven games for the gold medal-winning United States entry and was, accordingly, named to the official All-Star Team at the 2013 IIHF World Junior Championships in Ufa, Russia. 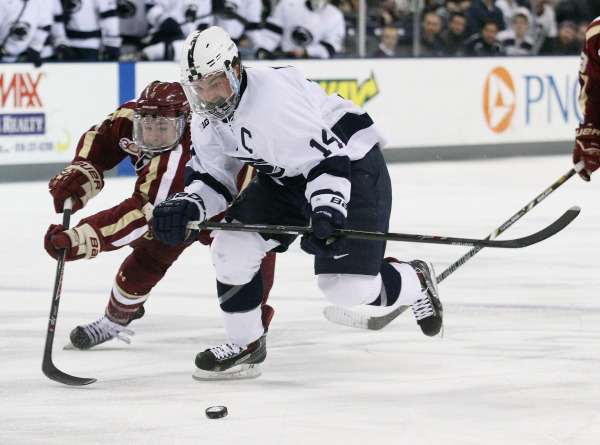 Following up that act as a junior now in his third year under the tutelage of Boston College’s legendary coach JERRY YORK, the almost unstoppable Gaudreau has been nothing short of sensational for the surging Eagles. The fourth round choice (# 104 overall) of the Calgary Flames at the 2011 National Hockey League Draft currently leads the entire country in scoring having totaled 21 goals and 48 points in 24 NCAA games thus far and, perhaps most impressively, has registered at least one point in twenty-three of Boston College’s twenty-four contests (17-4-3) this term. The ever dangerous Gaudreau is presently in the midst of a 19-game point-scoring streak which, not surprisingly, is the longest such run in the nation. The last team to successfully keep Gaudreau’s name off the scoresheet was none other than the # 1 ranked University of Minnestoa Golden Gophers, who thwarted the Eagles 6-1 at the Mariucci Arena in Minneapolis back in late October. The diminutive winger (5’9″ 160 lbs) seems to have shifted his game into an even higher gear since the 2nd Annual Three Rivers Classic in Pittsburgh, where Gaudreau was honored as the holiday tournament’s Most Valuable Player after notching two goals and five points in victories over Bowling Green and Penn State, respectively. Only this past weekend in Chestnut Hill, the flourishing Gaudreau established a new career high by collecting five assists during Boston College’s 7-2 destruction of the visiting University of Maine Black Bears. Meanwhile, there are only three schools in all of Division I men’s ice hockey (the University of Alabama – Huntsville, the United States Military Academy and American International College) who have surrendered more goals per game than the hapless Penn State Nittany Lions have in what is their second year of competition at the NCAA varsity level. The hosts will also have to make due without one of their better defensemen when Boston College, who have won three NCAA national championship titles in the past six years alone, appear at the Pegula Ice Arena as a result of the one-game suspension handed out by the disciplinary committee of the Big Ten Conference. With the Eagles being the highest scoring team in all of college hockey this season, conditions could be ideal for Gaudreau to have a very enjoyable evening in Happy Valley. Boston College left wing JOHNNY GAUDREAU (13) slides the puck past Notre Dame goaltender STEVEN SUMMERHAYS (1) to score a first period goal during the Hockey East conference battle that was conducted under harsh wintery conditions on the artificial ice surface installed outdoors at iconic Fenway Park, the normal home field for Major League Baseball’s Boston Red Sox for a series of college hockey matches this season. 1 go 2 as ….. 7-2 … W … R.P.I. Penn State Canadian legionnaire DYLAN RICHARD (12), the freshman center from Sherwood Park, Alberta, and Boston College left wing CHRIS CALNAN (11), the freshman from Norwell, Massachusetts, who was the third round choice (# 79 overall) of the Chicago Black Hawks at the 2012 National Hockey League Draft, battle for control of the puck during the lopsided 2014 Three Rivers Classic Final at the Consol Energy Center in Pittsburgh, Pennsylvania. The heavy underdogs actually scored the very first goal of the game roughly five minutes in but the five-time NCAA national champion were in absolutely no mood for any hint of a stunning upset and forcefully responded by rattling off eight consecutive goals without reply as # 6 ranked BOSTON COLLEGE obliterated hapless PENN STATE 8-2 in the one-sided FINAL of the 2013 THREE RIVERS CLASSIC in Pittsburgh. Nittany Lions left wing CASEY BAILEY, the snake-bit sophomore from Anchorage, Alaska, who led fledgling Penn State last season with 27 points (14 goals) in 27 NCAA games, netted just his second goal of this term at the 4:46 mark of the first period. And head coach GUY GADOWSKY’s squad even continued to lead the powerful Eagles for most of the opening stanza at the Consol Energy Center. But then the roof caved in very quickly all of a sudden after Nittany Lions right wing ZACH SAAR, good-sized (6’4″ 235 lbs) freshman from Richland, Michigan, took an undisciplined penalty for slashing. ANGELO CANGELOSI, the freshman right wing from Estero, Florida, sent an inviting puck into the crease and fellow rookie RYAN FITZGERALD, the fourth round selection (# 120 overall) of the Boston Bruins at the 2013 National Hockey League Draft this past summer, beat Penn State starting goaltender MATTHEW SKOFF through the five-hole to level the score with his eighth goal this term for Boston College. The Eagles stormed out in front just 33 seconds later after top line right wing KEVIN HAYES, the senior from Dorchester, Massachusetts, who was the first round choice (# 24 overall) of the Chicago Black Hawks at the 2010 NHL Draft and is currently the second-leading scorer with 28 points in 18 NCAA games for Boston College, caught the Nittany Lions shot-stopper slightly out of position and took advantage to score his 11th goal of this season. But the traditonal Hockey East juggernaut which has celebrated four NCAA national championship titles in the last baker’s dozen years, alone, was really only just getting started. Boston College center RYAN FITZGERALD (19), the 19-year-old from North Reading, Massachusetts, who was one of the very last players cut from the United States junior national team currently competing at the 2014 IIHF World Junior Championships in Sweden, beats Penn State goaltender MATTHEW SKOFF (31) to level the match on the power play late in the first period of the 2013 Three Rivers Classic Final at the Consol Energy Center in Pittsburgh. Penn State had a chance with the power play when Pittsburgh native TRAVIS JEKE, the seldom-used sophomore defenseman making just his second appearance of this 2013/14 season, was sent to the penalty box early in the middle frame but the Nittany Lions failed to capitalize and Boston College cranked up its potent offense to generate three more goals in a six-minute span shortly thereafter. Canadian legionnaire DESTRY STRAIGHT, the junior left wing from West Vancouver, British Columbia, who had scored three goals in 14 NCAA games this season coming into the 2nd Annual Three Rivers Classic Final in Pittsburgh, found the back of the Nittany Lions’ net twice for the surging Eagles in the second period alone. And star left wing JOHNNY GAUDREAU, the junior left wing from Carneys Point, New Jersey, who was one of three finalists for the presitigious Hobey Baker Memorial Award symbolic of the best player in all of college hockey last season, also added his second goal in as many games for Boston College at this holiday tournament in Pittsburgh. The Penn State bench boss Gadowsky relieved the beleaguered Skoff after forty minutes and sent out third-string goaltender P.J. MUSICO, the junior from Orange, California, to face mighty Boston College in the last period at the Consol Energy Center but it would make little difference. Eagles defenseman DANNY LINELL soon greeted the new Nittany Lions netminder within four minutes by lighting the lamp on the power play with a slapshot from the right face-off circle. It was a first goal of this term for the versatile junior from Great Neck, New York, who has, indeed, appeared in all of Boston College’s games this season. The now unstoppable Straight completed his hat trick for the evening after a commendable rink-length, solo rush that culminated with a shot that beat the Penn State reserve Musico to the short side at the 13:33 mark of the last period. A scant 18 seconds later, MICHAEL SIT, the junior left wing from Edina, Minnesota, was able to fire home an eighth and final goal for Boston College after good work in the offensive zone by the defenseman Jeke and QUINN SMITH, the junior right wing from Fairfield, Connecticut. The Never-Say-Die Nittany Lions were, in fact, able to rescue a measure of pride very late on when freshman left wing DAVID GOODWIN converted on the odd-man rush with linemate ERIC SCHEID to register his fourth goal of his NCAA career. Boston College star left wing JOHNNY GAUDREAU (13), the fourth round pick (# 104 overall) of the Calgary Flames at the 2011 NHL Draft who was honored as an NCAA (East) First Team All-America selection last season, passes the puck ahead of pursuing Penn State Canadian legionnaire LUKE JUHA (4), the sophomore from Mississauga, Ontario, who has emerged as a real quarterback on the blue line for the developing Nittany Lions, during the 2013 Three Rivers Classic Final at the Consol Energy Center in Pittsburgh. Boston College goaltender BRIAN BILLETT, the competent junior from Brunswick, Maine, stopped an impressive 58 of 59 shots faced in the Eagles’ two victorious contests against Bowling Green and Penn State at the 2013 Three Rivers Classic and could easily have been named to the official tournament All-Star team but, rather, has to be content with his improved numbers (12 ga, 2.24 avg, .928 svpct) for this current NCAA season. A pair of # 12′s meet as Boston College right wing KEVIN HAYES (left), the homegrown senior from Dorchester, Massachusetts, who was the first round choice (# 24 overall) of the Stanley Cup champion Chicago Black Hawks at the 2010 National Hockey League Draft, and Bowling Green left wing BRYCE WILLIAMSON battle for the puck during the opening game of the 2ND ANNUAL THREE RIVERS CLASSIC tournament held at the Consol Energy Center in Pittsburgh, Pennsylvania. A trio of goals either scored or created by one of last season’s three finalists for the prestigious Hobey Baker Memorial Award all within the first seven minutes of the contest set the five-time NCAA national champion well on its way to a convincing shutout victory as # 6 ranked BOSTON COLLEGE blanked proud BOWLING GREEN STATE UNIVERSITY in the the first semifinal match of the 2013 THREE RIVERS CLASSIC in Pittsburgh. Eagles star left wing JOHNNY GAUDREAU, the fourth round selection (# 104 overall) of the Calgary Flames at the 2011 National Hockey League Draft and honored as an NCAA (East) First Team All-America last season after totaling 51 points (21 goals) in 35 games as a sophomore for Boston College, wasted little time stamping his authority on the Three Rivers Classic opener. The junior from Carneys Point, New Jersey, collected a cross-ice pass in the neutral zone and sped down the right side before beating Bowling Green netminder TOMMY BURKE with one of his patented backhand attempts. This after only one minute and nineteen seconds had expired since the drop of the very first puck. Less than two minutes on, Gaudreau was directly involved again and provided the puck that Boston College defenseman TRAVIS JEKE carried all the way down the right side on surprisingly solo rush that ended when the sophomore rearguard also beat the Falcons netminder Burke with a backhander that went top shelf. It was a first goal of this 2013/14 NCAA campaign for the little-used native of Pittsburgh, Pennsylvania, who made 22 appearances (2 go, 5 pts) for the Eagles as a freshman but, for the most part, has found himself on the outside looking in this term. It should be remembered that head coach JERRY YORK’s club is without the services of two regular defensemen, IAN MCCOSHEN and STEVE SANTINI, two freshmen who are both currently competing with the United States junior national team at the 2014 IIHF World Junior Championships in Sweden and so it was a wonderful opportunity for the hometown kid Jeke to make his season debut for Boston College against Bowling Green at the Consol Energy Center. Boston College left wing JOHNNY GAUDREAU (13) extended his personal streak this season to twelve consecutive games with at least one point by scoring one goal and adding two assists against Bowling Green State Univeristy in the opening contest of the 2013 Three Rivers Classic holiday tournament held at the Consol Energy Center (the regular rink for the NHL’s Penguins) in Pittsburgh, Pennsylvania. The lethal Gaudreau was also an integral part of the pretty passing play with his two other talented linemates, center BILL ARNOLD and right wing KEVIN HAYES, in the offensive zone which permitted Boston College defenseman TED DOHERTY, the undrafted sophomore from Hopkinton, Massachusetts, to skate right out in front and, with the aid of a nifty little deke, draw Burke out of position enough to score his second goal of this NCAA season at the 6:45 mark of the opening period. This early flurry of offensive activity at the expense of the Falcons at the Consol Energy Center was more than enough for the in-form, if undermanned, Eagles defensive corps. Boston College received quality goaltending all evening long from BRIAN BILLETT, the junior from Brunswick, Maine, who stopped 27 shots in all and registered his first shutout of the season. 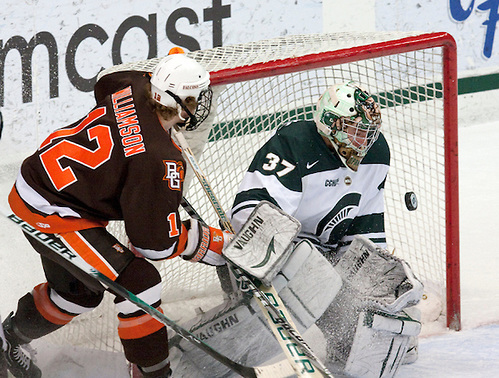 Bowling Green right wing MATT POHLKAMP, the 20-year-old freshman from Baxter, Minnesota, came close to spoiling Billett’s bid for the clean sheet but could only ring an attempt off the iron with roughly three minutes left in the game. Boston College scored for the fourth time unanswered when defenseman SCOTT SAVAGE, the 18-year-old freshman from San Clemente, California, wrist shot through traffic from the left point shortly after a face-off win from center PATRICK BROWN, the undrafted senior from Bloomfield Hills, Michigan, whose father, Doug Brown, skated in 854 NHL games and won two Stanley Cups in his career, almost three minutes past the halfway point of the contest. Altogether, four of Boston College’s five goals against Bowling Green in Pittsburgh were, in fact, accounted for by Eagles defensemen. Canadian legionnaire MIKE MATHESON, the sophomore defenseman from Pointe-Claire, Quebec, a fine individual play to drive to the front of the net and finish after good preparatory work from the debuting defenseman Jeke as well as Canadian legionnaire DESTRY STRAIGHT, the undrafted junior left wing from West Vancouver, British Columbia, with less than 20 seconds remaining in the Three Rivers Classic contest. Boston College defenseman MIKE MATHESON, the 19-year-old Canadian import who was picked in the first round (# 23 overall) of the 2012 NHL Draft by the Florida Panthers, skates around Bowling Green State University defenseman CONNOR KUCERA (3), the rugged junior from Twin Lakes, Indiana, and is about to score his third goal of this current NCAA season late in the third period of the 2013 Three Rivers Classic tilt at the Consol Energy Center in Pittsburgh, Pennsylvania. Boston College defenseman TRAVIS JEKE (8), the native of Pittsburgh who ended his highly successful evening with a goal and an assist in front of the hometown audience, congratulates fellow Eagles blueliner MIKE MATHESON after the latter closed out the scoring against Bowling Green State University with a goal in the third period of the opening game at the 2013 Three Rivers Classic at the Consol Energy Center in Pittsburgh, Pennsylvania. Friday’s afternoon contest at the Consol Energy Center in Pittsburgh features an intersectional clash between five-time national champion BOSTON COLLEGE, who last won the annual NCAA men’s ice hockey tournament in 2012, and the proud BOWLING GREEN STATE UNIVERSITY program, who celebrated their one and only national collegiate title almost three full decades ago now in 1984. Interestingly enough, it was current Eagles head coach JERRY YORK, the living legend who guided Boston College to national championship titles in 2001, 2008, 2010 as well as 2012, who was in charge behind the bench for the surprising Falcons when durable and persistent Bowling Green outlasted the heroic University of Minnesota – Duluth in an epic NCAA Final that required no fewer than four overtimes to decide. Despite the fact that Boston College are minus the services of three freshmen (defensemen IAN MCCOSHEN and STEVE SANTINI as well as backup goaltender THATCHER DEMKO) who are presently on duty with the United States junior national team at the annual IIHF World Junior Championships, it is still the powerful Eagles, who are currently ranked # 7 in the country by the USCHO.com survey and # 6 in the nation by both the USA Today/USA Hockey poll as well as the “PairWise Comparison Ratings” produced by College Hockey News, who are the clear favorites to win the 2nd Annual Three Rivers Classic in western Pennsylvania. The real danger man on the puck for Boston College is prolific left wing JOHNNY GAUDREAU, the 20-year-old junior from Carneys Point, New Jersey, who was an NCAA (East) First Team All-America selection and one of only three finalists for the prestigious Hobey Baker Memorial Award last season. Gaudreau, the fourth round choice (# 104 overall) of the Calgary Flames at the 2011 National Hockey League Draft who scored seven goals in seven games for the gold medalist United States at the 2013 IIHF World Junior Championships twelve months ago, leads Boston College with both 13 goals and 28 points in 16 NCAA games thus far this season. Bowling Green will also have to be wary of Eagles right wing KEVIN HAYES, the homegrown senior from Dorchester, Massachusetts, who was the first round choice (# 24 overall) of the Chicago Black Hawks at the 2010 NHL Draft and is currently right behind Gaudreau on the Boston College scoring chart with both 10 goals and 14 assists in 16 NCAA games this term, among others such as center BILL ARNOLD (16 ga, 4 go, 20 pts), the homegrown senior from Needham, Massachusetts, who was the fourth round choice (# 108 overall) of the Calgary Flames at the 2010 NHL Draft, as well as undrafted freshman AUSTIN CANGELOSI (16 ga, 7 go, 14 pts). Another bona fide scoring threat for the Eagles is RYAN FITZGERALD (16 ga, 7 go, 15 pts), the freshman right wing who was tabbed by the Boston Bruins in the fourth round (# 120 overall) of the 2013 NHL Draft this past summer and was just recently one of the very last players to be released from the United States junior national team that just went to Sweden. Altogether (including both McCoshen and Santini), Boston College benefit from having ten players on the 2013/14 roster who are talented enough to have already been drafted by National Hockey League clubs. Boston College netminder BRIAN BILLETT, the 21-year-old undrafted junior from Brunswick, Maine, made just two appearances for the Eagles last term and had a total of ten career NCAA games (2.85 avg, .900 svpct) under his belt heading into this 2013/14 campaign, has already played ten games (2.58 avg, .917 svpct) for the Eagles this season and will probably start both of his team’s contests at the 2013 Three Rivers Classic tournament hosted by the Consol Energy Center in Pittsburgh, Pennsylvania. In direct contrast, the less fortunate Falcons under the competent tutelage of former University of Miami (Ohio) can career minor league right wing CHRIS BERGERON do not have anybody in the changing room who has already had his rights reserved by an NHL franchise. Bowling Green are do have an experienced, quality rearguard on the blue line in RALFS FREIBURGS, the 22-year-old sophomore from Riga who appeared in all seven games for senior national team of Latvia at the 2013 IIHF World Championships co-hosted by Finland and Sweden last spring. The reliable Freiburgs has recorded an impressive 13 assists in 20 games for the Falcons this term. Between the pipes for Friday’s contest for formidable Boston College will most be TOMMY BURKE, the 22-year-old sophomore from Chaska, Minnesota, who has put up better numbers (11 ga, 2.38 avg, .914 svpct) in his second collegiate campaign for Bowling Green thus far. Canadian legionnaire BRYCE WILLIAMSON, the 24-year-old right wing from Seba Beach, Alberta, leads Bowling Green State University this term with both eight goals and 17 points after the first 20 NCAA games. Countryman MARK COOPER, the 21-year-old sophomore right wing from Scarborough, Ontario, and BEN MURPHY, the 22-year-old sophomore right wing from Duxbury, Massachusetts, have each also both found the back of the net on eight occasions this season, as well. Sparkplug center DAN DI SALVO, the diminutive (5’8″ 170 lbs) junior from Rolling Meadows, Illinois, leads all Falcons forwards with 11 assists and is also second overall in scoring for Bowling Green with 15 points in 20 NCAA games. Bowling Green Canadian legionnaire BRYCE WILLIAMSON (12) has scored combined total of 35 goals in 135 career NCAA games for the Falcons to date but is almost sure to be confronted by tight marking from diligent Boston College defenders in the opening contest of the 2013 Three Rivers Classic at the Consol Energy Center in Pittsburgh, Pennsylvania. 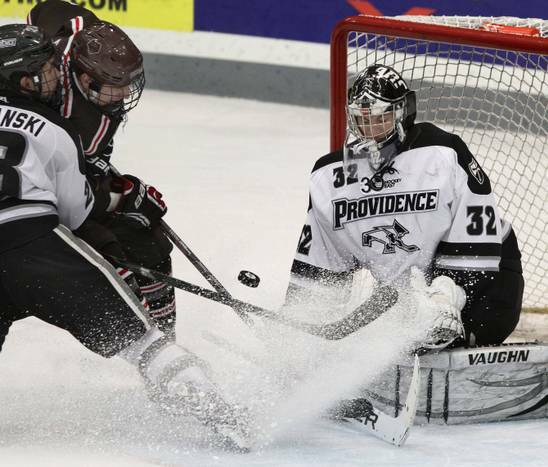 For a second consecutive holiday season this winter, Providence College will be without the services of workhorse goaltender JON GILLIES (32) for the time being because the standout sophomore from South Portland, Maine, who was named an NCAA (East) Second Team All-America as a freshman for the Friars will, once again, be part of the United States squad competing at the annual IIHF World Junior Championships. 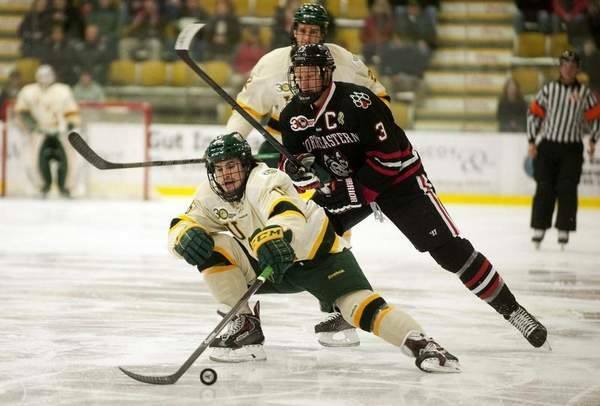 Vermont right wing PETER MASSAR (11), the homegrown redshirt senior from Williston who began his NCAA career at Clarkson University before transferring out after his sophomore campaign, struggles to maintain posession of the puck under pressure from Northeastern Canadian legionnaire JOSH MANSON (3), the junior defenseman from Prince Albert, Saskatchewan, who was the sixth round pick (# 160 overall) of the Anaheim Ducks at the 2011 National Hockey League Draft and is the son of a former rugged professional player with more than 1,100 NHL games to his credit, during the recent Hockey East tilt won by the visiting Huskies 3-0 at the Gunderson Fieldhouse in Burlington. Eight out of the eleven Hockey East teams will quickly return to the ice the first weekend after the arrival of Christmas Day as Boston College, Maine, Massachusetts, New Hampshire, Northeastern, Providence, UMass-Lowell and Vermont will all be participating in a variety of holiday tournaments. 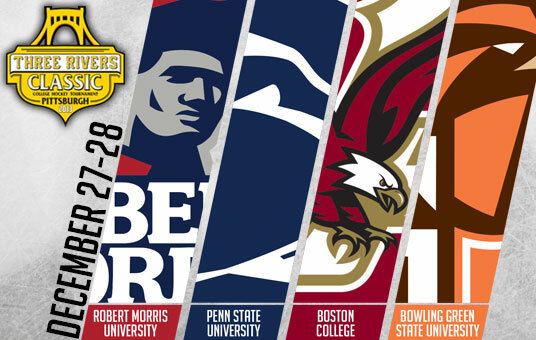 Boston College will be traveling to western Pennsylvania for the second annual THREE RIVERS CLASSIC hosted by the Consol Energy Center, the home of the National Hockey League’s Pittsburgh Penguins. The Universities of Maine and New Hampshire, respectively, will be migrating south to participate in the 14th annual FLORIDA HOCKEY CLASSIC, a tournament which is always held in the little southwestern town of Estero (total population of roughly 18,000 people) at the Germain Arena (official capacity for 7,082 spectators), the regular rink of the East Coast Hockey League’s Florida Everblades. In the meantime, the University of Vermont are staying home on campus in Burlington to host the 17th installment of the CATAMOUNT CUP, a trophy which was first offered in December of 1990, and will be joined there by visiting Hockey East rival UMass-Lowell. Northeastern University as well as Providence College are both heading north to attend the traditonal LEDYARD NATIONAL BANK CLASSIC party being thrown at the Thompson Arena in Hanover, New Hampshire, by the Ivy Leaguers of Dartmouth College while the University of Massachusetts will be making the short trip just beyond its southern border to skate in the 21st annual UCONN HOCKEY CLASSIC, an interesting four-team affiar which includes three of the four Division I schools from “the Constitution State” — host University of Connecticut, last season’s beaten NCAA Finalist Quinnipiac University as well as Sacred Heart University. Boston College star left wing JOHNNY GAUDREAU (13), the prolific junior from Carneys Point, New Jersey, who was selected in the fourth round (# 104 overall) of the 2011 NHL Draft by the Calgary Flames and has piled up 55 goals and 123 points in 95 NCAA games to date since that time, is averaging nearly two full points per game for the Golden Eagles this season after being named an NCAA (East) First Team All-America as well as one of only finalists for the prestigious Hobey Baker Memorial Award as a sophomore. University of Massachusetts – Lowell netminder CONNOR HELLEBUYCK (37), the fifth round (# 130 overall) choice of the Winnipeg Jets at the 2012 NHL Draft, has continued the same sort of form this term that saw the sophomore from Commerce, Michigan, earn all kinds of accolades as a freshman for the River Hawks last season including the award as Hockey East Goaltender of the Year as well as the Hockey East Tournament Most Valuable Player honor. 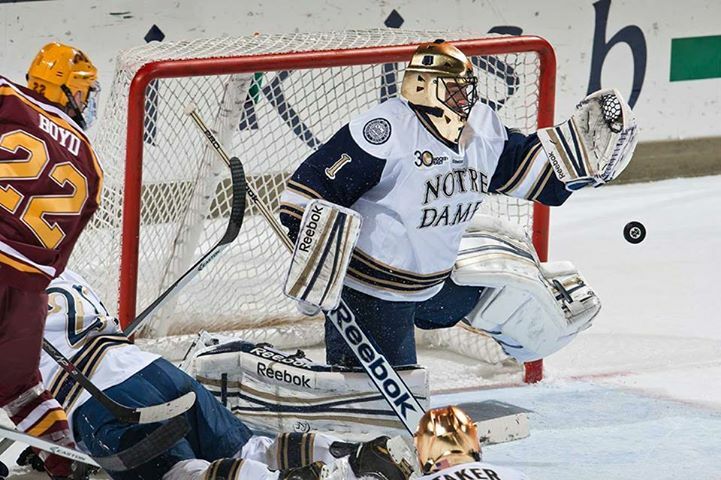 University of Notre Dame goaltender STEVEN SUMMERHAYS (1), the undrafted senior from Anchorage, Alaska, who is having a career year, statistically speaking, in his final collegiate campaign for the Fighting Irish, focuses sharply on the airborne puck during the NCAA non-conference clash with the mighty University of Minnesota earlier this season at the Compton Family Center in South Bend, Indiana.